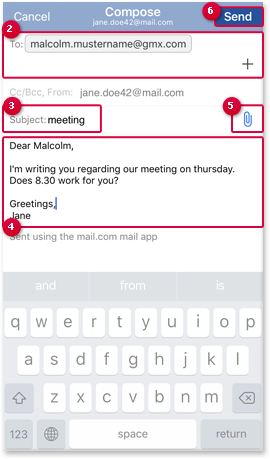 You can use mail.com mail app (iOS) to compose emails. Tap the Compose email icon above the email list. 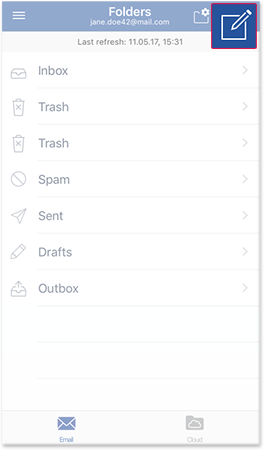 The app will switch to the Compose email view. ... or select one from your contacts. To do so, tap the + icon to the right of the To field. Enter a subject for your email into the respective field. You can add an attachment. Tap the paperclip icon on the right and select a file. When done, click send on the upper right. You will see two fields. All recipients entered into the Cc field will be visible to one another. All recipients in the bcc field will get the email as well, but won't appear as recipients to the rest. angezeigt.